This is a wonderful baked salmon recipe, complete with mixed roasted vegetables. The vegetables are quickly sauteed, then roasted in the pan with the salmon fillets for an easy dinner recipe any day of the week. Salmon is such a healthy fish, as well as being delicious. Peel the onions. Cut them in half lengthwise and then quarter them. Peel the carrots and cut them into chunks. Quarter the zucchini and cut it into chunks. Core and seed the red pepper and cut it into chunks. Heat 1 tablespoon of oil in a skillet. Add the onions, garlic, carrots, thyme, salt and pepper. Cook for 10 minutes. Stir in the zucchini, red pepper and vinegar. Transfer it all to a baking dish. Bake for 25 minutes at 425°F, stirring often. Combine the remaining oil, thyme, salt and pepper and use the mixture to brush the top and sides of the fish. Place the salmon, skin side down, on top of the vegetables. Bake for 10 to 15 minutes or until the fish is opaque. There isn’t one thing I would change about this healthy recipe. Every ingredient brings great nutritional value as well as taste to the table. Just enjoy. 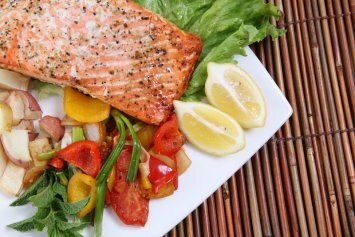 Salmon is on our 10 healthiest foods list and there is good reason. The Omega 3 oils in salmon are essential for good health so you can enjoy it often. It is also a very tasty fish. It’s wonderful isn’t it when healthy food tastes great too? Double duty food! If you are looking for diabetes friendly recipes, this is a fantastic one to try. It is low in carbs, high in protein and is baked with lots of vegetables. I would double the vegetables I cook for a diabetic recipe. Find another baked salmon recipe as well as other fish and seafood recipes here. Put 1/2 pint chicken or fish stock in a skillet and mix in 1 tablespoon of green Thai curry (You could make your own) add 2-3 chopped and cleaned Lemon Grass stalks along with a can of Coconut milk. Simmer until well mixed and curry dissolved, then add 300 grams rice- I use Basmati but you can use whatever you prefer. Wait until the rice has nearly absorbed all the liquid, stir a little then place the 2 Salmon fillets or steaks on the top. Cover and simmer for 15 – 20 minutes. I played around with this for three or four occasions and am still experimenting but it works almost no matter what you do with it. You can cook the rice until it’s sticky or needs draining. Just don’t over cook the salmon! I forgot to add that you can put in a few green beans along with the rice as it’s being cooked. Serve with either a salad or some light vegetables, seems to work, no matter what! Very colourful dish. Loved it! I used a deep casserole dish to bake the veggies and it worked out well.